New hosting companies crop up every day it seems. So what separates the hosting solutions that make it from those that fold? If you’re thinking about starting a web hosting company of your own, this question is forefront in your mind. Keep reading for 4 tips to enjoying success with your hosting business. Starting a hosting business initially is much like starting any other business – basic building blocks must be set in place. It is necessary to create a business model taking into account the legal and organizational aspects of getting up and running. Don’t forget the marketing – carefully consider your service positioning and what your main benefits to the end user are. What type of a web hosting provider will you be? Generally web hosting providers can be categorized into 3 main types of businesses. The first is companies that have web hosting solutions at the core of their service offering – web hosting is their bread and butter. Another common type of provider is a company that has decided to bundle web hosting into existing services, such as design studios, web developers, and communicative and interactive agencies for example. The third type of provider does not have web hosting as its main offering, but has added hosting to its services in order to diversify its portfolio. Internet providers, for example, often tag on web hosting services. Just getting started? If you want to get into the web hosting business, do your market research and prepare your business plan. Find out how much it costs you to get a new customer. For many, the best thing is to start small. Get a reseller account, something you can justify as a “waste” in your budget, because, as with startups in general, it’s probably going to be a long while before you turn a profit. Patience and perseverance are the name of the game and gradual growth is what you can expect. As a hosting provider, you can either have your own technical team, or you can outsource hosting management. Having your own experts on staff is a popular business model, but does come with various expenses such as wages for highly qualified specialists, training, social security, and other operational costs. Not every new web hosting provider is able to incur these expenses, so for them, transferring technical support functions to an outsourced IT staff is the better customer service alternative. There are many different options available to you when selecting a control panel to manage your web server. ISPmanager is an excellent and affordable control panel option – it is packed with a wide variety of powerful features and boasts plenty of administrative tools such as reseller options, a trouble ticket system and a notification system, amongst other important functions. ISPmanager offers full control – you can set up and manage hosting packages or manage customer access and permissions, all from one easy to use interface. ISPmanager accommodates different hosting options, such as shared, reseller, DNS and mail hosting. It also works with the most popular operating systems, can handle mixed-platform environments and can manage a wide array of third party software. As a web hosting provider, you need to be sure that the control panel you choose can meet all your business requirements. ISPsystem offers a variety of hosting automation and hosting management solutions to help your company grow business and improve efficiency. 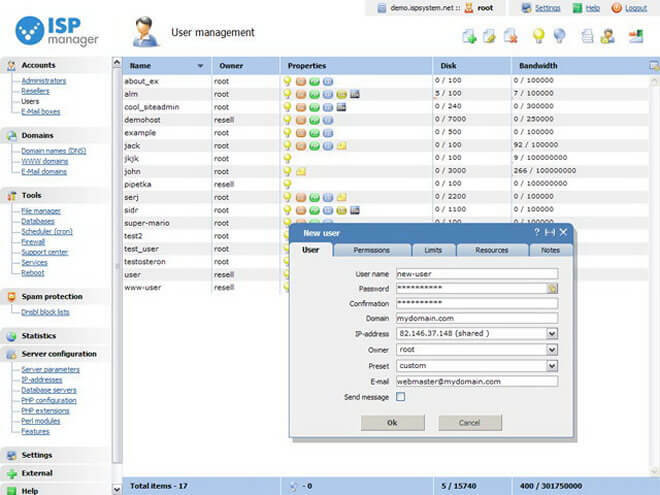 ISPmanager software is a hosting control panel for web-server management, automating the creation of user accounts. One of the many shared hosting software solutions offered by ISPsystem that allows you to automate business functions. ISP manager is a excellent alternative to control panels such as cpanel especially when just starting out in the web hosting industry or just wanting to give your clients something different, there are also some very useful plugin such as bill manager which would make life allot easier. ISPManager is a viable option to new companies, I agree. In today’s rapidly changing technological market and the advances in cloud hosting, it is extremely important for a new company in shared web hosting to provide mutlti-servers. ISPManager offers the ISPCluster as software solution and you are able to manage “many servers” through the control panel. Multi-Server load balancing technology use to be the “big claim” that cloud hosting had over shared, but today many reliable web hosts are implementing this technology and have so for some time. It’s important that ISPManager is able to incorporate this into their software solution and create a flexible control panel that can meet the needs of a demanding online world.